With upscale interiors a free airport shuttle an on-site lounge and complimentary Wi-Fi it's no wonder the Hotel Indigo Durham-Research Triangle Park earns high marks from our guests. The eye-catching six-story Hotel Indigo equips its bright modern rooms with free Wi-Fi flat-panel TVs CD/DVD players coffeemakers and hairdryers. The perks extend beyond the rooms: don't miss the indoor pool hot tub and 24-hour fitness center. If it's work that's brought you to town you'll want to take advantage of the on-site business center and concierge services. Pets are welcome. There's a complimentary shuttle to all attractions within a five-mile radius. 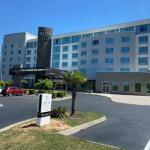 Hotel Indigo is conveniently located in Research Triangle Park three miles from Raleigh Durham International Airport. Downtown Durham's hip new restaurant district is ten miles away. Downtown Raleigh is 17 miles from the hotel. Brier Creek shopping center and Frankie's Fun Park are both eight miles. The NC State Fairgrounds is a ten-mile drive.